Laurentia Tan has ended her fantastic year of 2012 by being awarded the a host of awards which including the Public Service Star (B.B.M) – the Singapore’s equivalent of a medal from the British Honour’s List; Equestrian Federation of Singapore Athlete of the Year Award 2012; Overseas Deaf Sports Personality of the Year; The Straits Times’ Star of the Month (September) (the ST’s Star of the Year 2012 has yet to be announced but will be selected from the 12 Stars of the month) and The Hugh Ogus Award for Postgraduate Achievements . 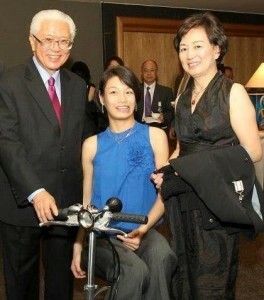 Lauren is pictured left with the President of Singapore Dr Tony Tan and her mother Jannie at the award ceremony in November 2012. Laurentia Tan won Bronze during the Dressage Individual Championship Test Grade Ia on day 4 of the London 2012 Paralympic Games at Greenwich Park on September 2. If that was not enough Lauren went on to win Silver during the Equestrian Dressage Individual Freestyle Test – Grade 1a on day 6 of the games. Laurentia Tan started riding at Diamond when she was six years old in 1986. At that time she was unable to sit or walk unaided having been diagnosed with cerebral palsy. Riding was a form of therapy but also an activity that she loved and excelled in. After a short break from riding to go to university, she returned to Diamond in 2005 joined the Tuesday evening riders, instructed by Penny Pegrum. 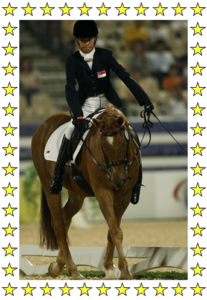 In the Beijing Paralympics, Laurentia gained two bronze medals competing as an individual for the Singapore Team.